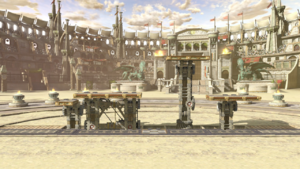 Coliseum (闘技場, Arena) is a stage in Super Smash Bros. for Wii U and Super Smash Bros. Ultimate from the Fire Emblem series. The stage uses underground machinery to provide a variety of different platform layouts. This stage is where Lucina is fought for her unlocking battle in Super Smash Bros. for Wii U and where Ike and Corrin are fought for their unlocking battles in Ultimate. Coliseum takes place in a desert coliseum. As the battle progresses, various platforms will quickly rise and change the layout of the stage, similarly to Arena Ferox. The starting layout is long, flat and simple. Additionally, the stage in general has walk-off blast lines and no bottom blast line. 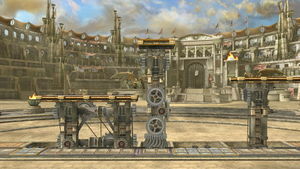 In Super Smash Bros. for Wii U, the Ω form features a high rise platform on an arena that extends below the blast line. The design of walls surrounding the bottomless pit can be seen. In Super Smash Bros. Ultimate, the Ω form and Battlefield form are similar to SSB4's Ω form; however, the main platform does not extend below the blast line and is resized and reshaped to match Final Destination and Battlefield, respectively. The three soft platforms of the Battlefield form are made of stone and are unique to this form. 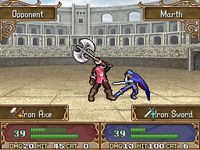 Marth fighting in an arena in Fire Emblem: Shadow Dragon. Arenas, also referred to as coliseums, are a recurring gameplay element that have appeared in most of the Fire Emblem games. They can optionally be visited by any unit for a small fee, allowing said unit to engage in a one-on-one battle with an unaffiliated unit, receiving double the entry fee in case of a victory. In addition, victory against these units still counts towards a characters EXP totals; however, any units that fall in the arena are lost forever, as if in a normal battle - as such, the player can potentially allow their units to flee the arena, at the cost of losing money from entering. The design of the stage does not draw inspiration from any particular Fire Emblem game; however, the dragon statues bear resemblance to the Fire Dragons and Earth Dragons from the Nintendo DS remakes of the Archanea games. Sakurai has also made a reference to the original game in a Miiverse comment. Coliseum is banned from tournaments due to the platforms rising and lowering forcing players to constantly have to adapt, and the fact that the stage has walk-off blast lines, allowing for camping and early KOs. Coliseum in Super Smash Bros. for Wii U.
Close-up of Ike and Marth on the stage. Panorama of Coliseum from Ultimate. All of the Fire Emblem veterans on the stage in Ultimate. Luigi fighting Snake on the stage. Simon in his Super Castlevania IV-inspired costume next to Richter on the stage. Villager using his neutral attack on Ryu. Zelda using her forward tilt on King Dedede. Zero Suit Samus using her down tilt. This page was last edited on April 16, 2019, at 08:30.